Early this year, representatives from Living Tree Academy (LTA) met with San Pedro Librarian Brianne Leiva with the purpose of initiating a partnership with the San Pedro Library. The LTA is developing a process in the United States to ship/ transport books via visitors, expats, and volunteers to San Pedro. The first shipment of books has already been donated to the library and there are plans to have more in the coming weeks. Librarian Brianne Leiva welcomed this assistance to the library. “We are happy to be working together with Living Tree Academy and appreciate their donation of books to the library. These new books will assist students who come to the library to do their homework,” said Leiva. “The library provides many services such as general information, printing services, and internet. We have holiday programs as well, like for Easter and during summer.” Leiva mentioned that with the new flow of books, the library expects to attract more people as they want everyone to make use of their services and resources. She is also making a call to volunteers in any trade to come to the library and get involved in the different programs they are initiating. According to Living Tree Academy President, Anthony Gilmore, the organization has been working in Belize since 2003 and had done similar projects in other parts of the country such as Independence and Monkey River in the Stann Creek District. The goal is to help children access education through sponsorship and funding assistance. 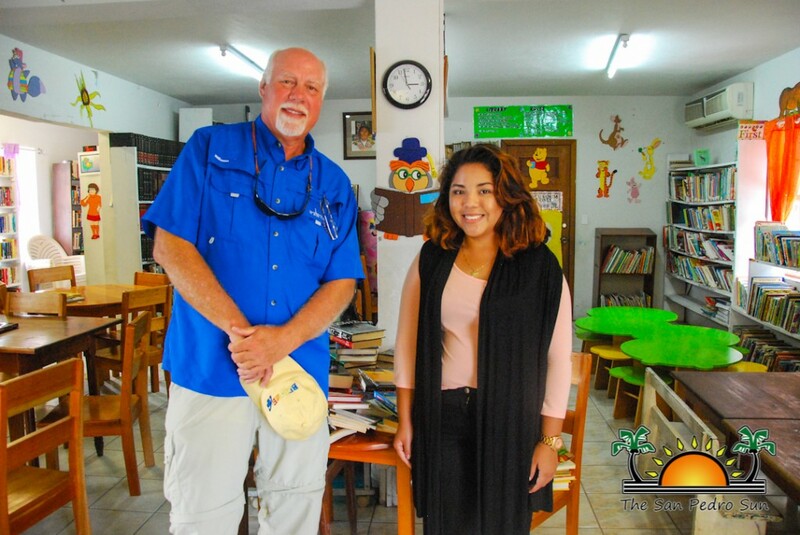 “After coming into the library and meeting with the library staff, we saw the need to help remodel the library and get more book shelves and more books as well. So the program works this way: the library staff knows what books San Pedro people want, and then we get those books in the United States and either ship or bring them down to the library,” explained Gilmore. “If there is a particular book which the library does not have, then it is requested and obtained.” Stated Gilmore. The program also includes an e-library system to assist students and people in general in their reading research. LTA is also working on building a high school/ vocational school two miles north of San Pedro Town. The project is estimated to take two years before is ready, with a fully operating library as well. “The same program we are having here in the library will be applied to the library in this new school we are building,” said Gilmore. “This library and campus will be available for everyone, especially the community up north that continues to grow. However, the assistance and the partnership with the San Pedro Library will continue,” ended Gilmore. As the partnership between LTA and the San Pedro Library continues to grow there will be more programs implemented, so everyone can benefit and get involved with the educational recourses that will be available. The San Pedro Library and LTA would like to inform the general public that the library is open, active, growing, and is an excellent place to get their reading materials and other useful resources. Living Tree Academy’s mission is to give children and their families a promising future by providing access to educational opportunities worldwide. LTA is thankful for the partnership with the San Pedro library and looks forward to continue working with the community of San Pedro.